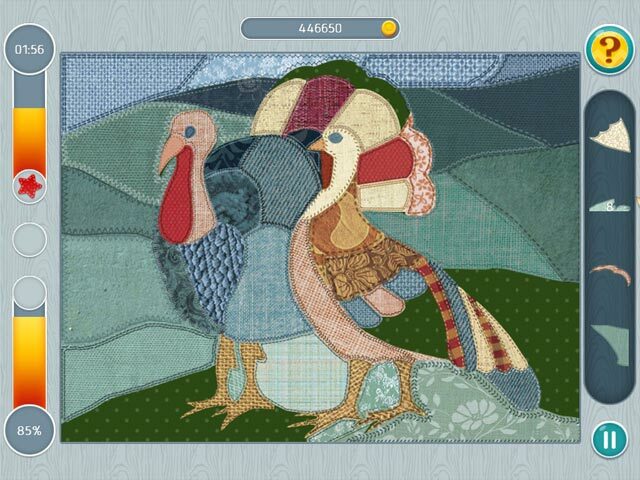 Thanksgiving Day Mosaic is an original puzzle game the whole family can enjoy! Pick out a turkey, bake pies, buy gifts, decorate the house and have people over! Bring Thanksgiving Day Mosaic into your home on Thanksgiving. Give yourselves and your loved ones a true holiday experience! Thanksgiving Day Mosaic is full of mosaic puzzles made of 6 different materials: wood, cloth, glass, paper, gemstones and metal. Assemble the patchwork puzzles and guess the picture: holiday traditions, original home decorations, the bounties of nature, the autumn harvest, family ties, Black Friday, native life, the history of the Plymouth colony and settlers from England. Assemble all the mosaics and find out new things about this holiday of harvest and gratitude in Thanksgiving Day Mosaic! Storyline and themed holiday setting. Thanksgiving Day Mosaic is rated 4.0 out of 5 by 6. Rated 5 out of 5 by Kimmycoo from Awesome! I totally loved this one and it has lots of replay value. Every year it will boost your Thanksgiving Day spirit! I love this game. 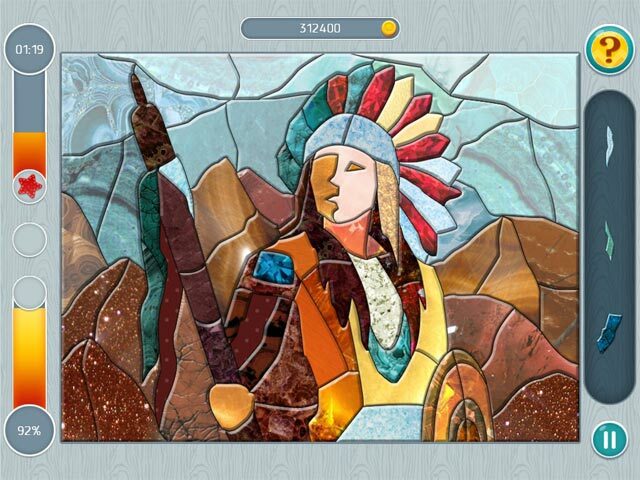 Rated 5 out of 5 by pennmom36 from THANX 4 GIVING US ANOTHER MOSAIC PUZZLE GAME If you're a puzzle geek like myself, you'll love this mosaic puzzle game. Recently they have added a Relaxed mode which is feature I appreciate because sometimes I just want the relaxing pleasure of trying to place the fragments correctly, but at my own pace instead of at the usual neck breaking speed needed to complete the mosaic within the time allotted. The idea behind this game is to assemble the mosaic picture with the fragments that become available to the right of the puzzle, which is about 8 fragments at a time. You will get one star for completing the puzzle, a second star for completing without mistakes and the third for completing the puzzle within the allotted time. You can use coins to purchase extra time in 30 second increments, or you can add more hints if you run out. There are 6 Rooms and each room has 20 levels. Six different materials are used, one in each room, starting out with Cloth, then moving onto Wood (my favorite) and eventually, Stained Glass, Gemstones, Paper and Metal. There are special tasks to accomplish which allows you to earn 18 different trophies as well, enjoy! Rated 5 out of 5 by kateblue222 from I'm giving thanks that the older style pictures have returned! Based upon the demo, this is a typical "Patchworkz"-type game with textured pieces, not actual photographs as found in this devs recent Halloween offering. Having actual photographs (instead of these) totally changed that Halloween game, making the puzzles way more simplified and the whole game more jigsaw-like. This offering is back to the usual style, so yay! Thanksgiving theme is well developed by the pictures, but the music is the usual music from this developer, so "Eh" to the music. That's why 3 stars there. There is a timer which seems more forgiving than most, but you can set relaxed mode and skip that feature entirely. Very satisfactory game of its type. I highly recommend it. Buying now. Rated 4 out of 5 by myxomatosis from Good Patchwork, But Incomplete First, this is the "Patchwork" type of inlay or jigsaw puzzle, not a numerical "Griddler" type. I love these puzzles when they're good. Get back to the original styles and bring 'em on! The original game "Patchworkz" is still the Gold Standard, with many beautifully sophisticated designs and much stunning artwork, and is presented in the style of the traditional "Inlay" puzzle. There are some others in the Very Good category, that I've played and replayed. The first two "Alice's," followed by Mosaics Galore and Frozen Patchworks, come to mind. This one is pretty good, as far as I got in the demo anyway. I'd happily buy Thanksgiving Day except that like reviewer sandyshome, I could only get 72 pictures, not the advertised 120. Saw the same complaint on the Forum. Repeated uninstallation-redownload did not help. Neither did the "Help" section. Rated 4 out of 5 by sandyshome from Where are the rest of the puzzles? 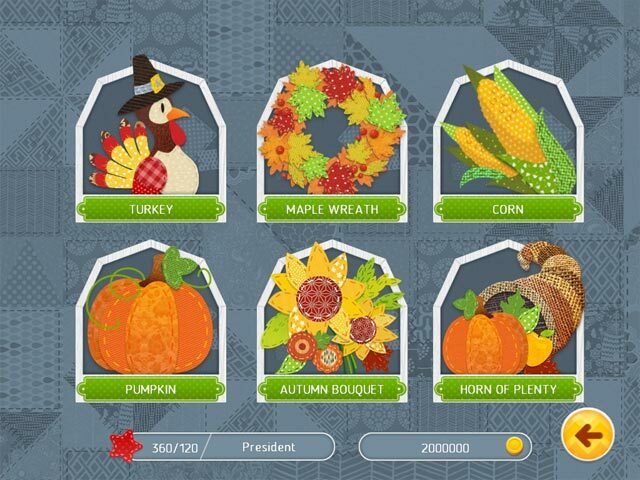 I enjoyed playing Thanksgiving Day Mosaic. I like how there were different "materials" used throughout the game. It kept my interest and I liked the pictures. Some of the puzzles probably could have been more challenging, but it was nice to have something fun that wasn't frantic. In the description above, it says there are "120 unique patchwork mosaics". Unless I'm missing something, there are only 72 puzzles. 12 puzzles in each of 6 groups. If there are more, I don't know how to find them. Also, the game just abruptly ended after I finished the last puzzle. There was no "thank you for playing", credits, etc. It was just over. These two things are the reason I'm only giving 4 stars instead of 5. Other than that, I really enjoyed playing. Rated 1 out of 5 by GraneeJ from Not a Mosaic I should know better than to buy without trying. I found this game irritating and boring and uninstalled it after completing a few levels. Even the tutorial wasn't particularly helpful in trying to figure out what parts of the picture needed to be replaced and what parts were already there. It was also cutesy racist which was definitely not in its favor. I don't recommend this game at all. Pick out a turkey, decorate the house and invite people over! 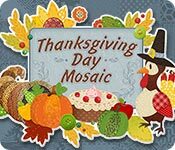 Thanksgiving Day Mosaic has 120 patchwork-style puzzles for the whole family!